We work with you to custom design beautiful plain and gemset jewellery items in gold or platinum. Our jewellers can custom make using traditional and modern manufacturing processes. We can repair your broken jewellery to ensure it is safe for you to wear again. Old, worn out rings and other jewellery items can be restored back to new condition. Get peace of mind with detailed valuations of your items for your insurance company. Our valuers can identify and grade your diamonds and coloured gemstones. We can work with you and your insurance company to provide fair estimates of your lost or stolen jewellery. Estate Distribution/Probate Valuations, Inventory Lists, Private Sale/Purchase Appraisals. Richard Donnell is a manufacturing jeweller and valuer, who has designed and custom made thousands of rings and jewellery items since 1952. He enjoys working with traditional methods, and restoring older pieces to their original condition. Assisting him is daughter, Deb Donnell, who has been working in the family business since 1984, and spent many hours of her childhood helping out behind the scenes. Deb has inherited her father's love of diamonds, precious gemstones, and beautiful jewellery. She has also followed in his footsteps as a jewellery valuer. Meet with one of our team to discuss your jewellery and valuation needs. Our founder, Richard Donnell established Donnell Jewellers in 1975. The retail store and workshop was located in the Triangle Chambers building in High Street, Christchurch, New Zealand. Donnell Jewellers traded from this location for over 40 years. However, in February 2011, the building was severely damaged by the Christchurch Earthquake, and later demolished. This background image shows the original retail store. Richard and his daughter, Deb, now operate the business by appointment only. Together they have over 100 years jewellery expertise. Both are GIA Diamonds Graduates and members of the GIA Alumni Association, Jewellers and Watchmakers of New Zealand (JWNZ), Gemmological Association of New Zealand (GANZ), and Jewellery Valuers Society of New Zealand (JVS). 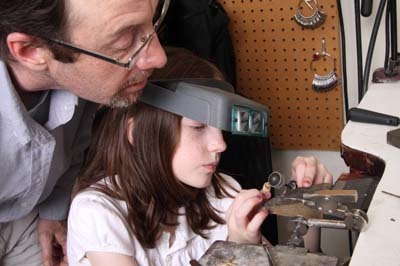 Richard is also a manufacturing jeweller (NZ Trade Certificate) and Deb is a GIA Applied Jewelry Professional.